Pompe à l’Huile, a sweet olive oil bread from Provence, made its glorious debut at our Taste of Provence Coronado Concert in the Park during the summer of 2010. Carmen discovered it from Jude (Apple Pie, Patis & Pâté), who slightly tweaked the original recipe from Saveur by "giving the poolish a 16-hour head start, instead of 30 minutes, for that extra hint of complexity that can only come from slow fermentation." That particular Concert in the Park was one of the most memorable culinary-themed picnics, because we discovered Pompe à l’Huile, socca (chickpea flour crepes), and rouille (saffron-garlic mayonnaise), all of which I've made several times since. Saveur describes Pompe à l’Huile as "a cross between a brioche and a focaccia...at the center of the spiritual food traditions that make a Christmas in Provence like none other in the world." The beauty of this bread is that you can experiment with the many flavored olive oils available, and there's no need to wait until Christmas to enjoy it. We've tried it with blood-orange, white truffle, lemon, and Tuscan Herb flavored oils. For this Tuscan Herb Pompe à l’Huile, I made it into a more savory loaf by reducing the sugar slightly, using a Tuscan Herb flavored olive oil from Coronado Taste of Oils (thank you, Bradley! ), and sprinkling the dough with salt before baking. I followed Saveur's recipe with the shorter, 30-minute poolish. Maybe if I tasted the 30-minute poolish loaf next to the 16-hour poolish loaf, I could detect the difference in complexity, but that will have to wait for another day. I tried to add a few dough embellishments to my sand dollar, but my dough art leaves a bit to be desired. 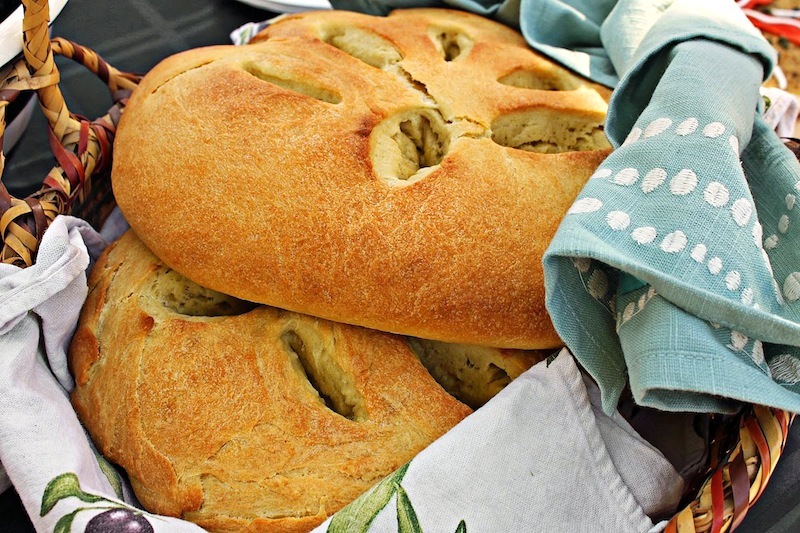 Regardless, everyone loved the infusion of Tuscan Herbs into this Provencal bread. Make a poolish: Put 1 1⁄2 cups of the flour, sugar, yeast, and 1 cup warm water (105-115 degrees F, measured with an instant read thermometer) into a large bowl and stir well with a wooden spoon to combine. Let the mixture sit in a warm spot until bubbly, about 30 minutes. Add remaining 2 1⁄4 cups flour, 3⁄4 cup of the oil, and salt to the poolish and stir until a dough forms. Turn the dough out onto a lightly floured surface and knead until smooth and elastic, 5–7 minutes. Grease a large clean bowl with the remaining 1 tablespoon of oil, place dough in the oiled bowl, and cover with a clean towel. Set the dough aside in a warm spot to let rise until doubled in bulk, 3–4 hours. Preheat oven to 400° F. Gently turn dough out onto a large sheet of parchment paper and gently stretch it with your fingers to form a 12" circle. Using a small, sharp knife, cut out 2"long slits, each about 1" wide, starting from the center of the bread and cutting toward the edge, and add few cuts on the edge, so that the dough resembles a sand dollar (discard dough scraps or bake them separately as a cook's-bonus nibble). Using your fingers, gently stretch the holes open a little wider so that they won't close up completely when bread is baked. Carefully transfer the dough, on the parchment paper, to a large baking sheet, sprinkle with coarse salt, and bake until golden brown and puffed, about 15 minutes. Transfer the bread to a rack to let cool, or serve warm. Congratulations, Denise. You have mastered the best bread on the planet. You captured the delicate balance of sweet and savory. Pompe a L'huile can be served for any meal of the day and - with a bottle of good wine, it's a meal in itself! Another bonus is that it holds up in the freezer and the refrigerator. I think the only advantage for the sixteen hour fermentation is a bit more crust, elasticity and firmness that may be helpful for transfer, but the quicker method is every bit as tasty. As for flavoring - so far, my personal best was made with some local olive oil that I infused with last year's clementine peels - so, I have a few more bottles of that brewing this year ... These loaves never fail to impress regardless of the occasion. I've made them by request for weddings, birthdays and funerals ... so there ya go. The perfect bread. Great post! Wow. That bread looks amazing. We haven't ever made bread, but this sounds do-able. Yours is beautiful as well. We may have to try it!